1. 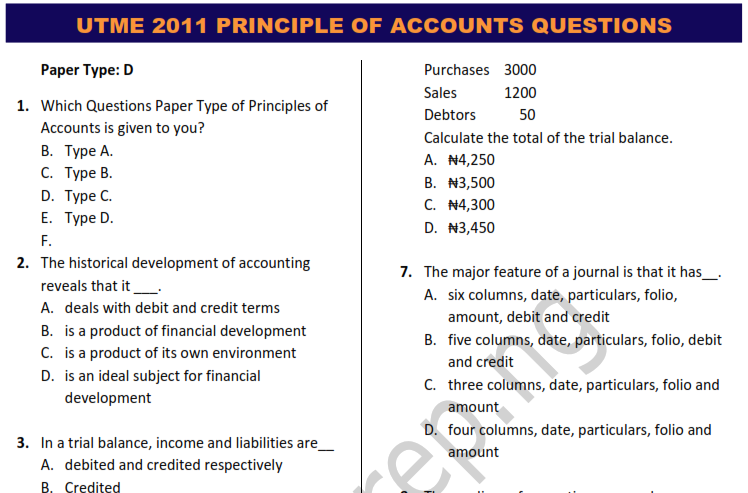 Which Questions Paper Type of Principles of Accounts is given to you? 2. The historical development of accounting reveals that it ___. 4. The principle of double entry ensures__. D. balance of cash account. The correct procedure for balancing account is __. 7. The major feature of a journal is that it has___. 8. The medium of correcting errors whose difference are shown in the trial balance is by the use of __. Adamu Stores bought accessories from Mu’azu Beverages for ₦400 on credit. A trade discount of 10% and a cash discount of 15% were provided. 9. Find the total amount paid. 10. Calculate the cash discount. 11. In bank reconciliation process, discrepancies caused by timing arises as a result of __. 12. The process of reconciling cheques between banks is termed cheque __. 13. In a bank reconciliation statement, interest charged for overdrawn balances should be added to the ___. Use the information below to answer question 14 and 15. 15. Find the current assets. 16. The type of expense charged against the administration of a firm is the ___. 17. In a period of declining price, which of the following methods would result in higher profit? 18. The item on the credit side of the trading account is the ___. Use the diagram below to answer question 19 and 20. 19. How many units were at hand as at July 30? 20. What is the value of stock as at the end of July 10 using FIFO? 21. A typical example of a real account is ___. 22. The control account can be used in ___. D. monitoring the efficiency of bookkeeping by accountants. USE THE DIAGRAM BELOW TO ANSWER QUESTION 23 AND 24. 23. What is the cost of goods sold? 24. Calculate the net profit. 25. Find the average stock for the period. 26. Calculate the cost of goods sold. 27. The costs that are directly traceable to the goods being produced is ___. 28. The production cost that does not form part of the product but is incidental to production and facilitates the production activities is the ___. 29. Work-in-progress is the ___. D. value of goods produced. 30. The major feature of the not-for-profit-making organization is that they are formed ___? D. in order to compute the receipts and payments account. 31. The subscription paid in advance is treated in the balance sheet of a club as ___? 32. The capital of a not-for-profit-making organization is referred to as ___. 33. The major objective of departmental accounts is to ascertain the ___. D. number of employees in each department. 34. The transactions relating to liquidation in partnership account is drawn by using ___. 35. The cost method of charging goods to branch is used where___. D. goods are of a perishable nature on which a pre-determined price is inapplicable. 36. The correct entries to record goods transferred to branch from head office is to debit___. D. goods sent to branch account and credit branch stock account. 37. The two accounts that are normally opened in the head office when goods are transferred to a branch are ____. D. goods sent to branch account and branch supplies. 38. Goods invoiced to a branch can be sent using ___. D. cost price and fixed percentage on selling price. 39. The major point of agreement carried by the partnership deed is___. D. the profit and loss sharing ratio of the partners. Use the information below to answer questions 40 and 41. 40. 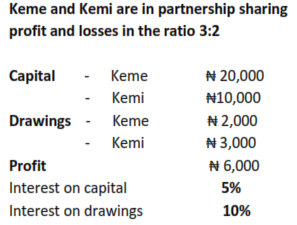 The interest on Kemi's capital is ___. 41. The interest on Keme's drawings is calculated as ___. 42. Which of the following can be used on admission of a new partnership? B. Profit and loss account. 43. Goodwill is determined using __. A. capital contribution of old partners. B. number of partners admitted. D. number of active partners. 44. The founders of a company are __. 45. The fund in which all government receipts are paid is __. 46. Which of the following accounts for the highest revenue to Nigeria? 47. If Aboki Holdings Limited issued 120,000 ordinary share of ₦2.00 each at market value of 5.50k each, the share premium would ___. 48. Which of the following is a signatory to federal government account? B. Governor of Central Bank. 49. The chief accounting officer of a local government is the __. 50. Which of the following signs general warrant for the release of money from the consolidated revenue fund?